Add the almonds, oats, dates, pumpkin purée, Grain Berry Onyx Super Antioxidant Smoothie Booster, protein powder, and spices to the food processor. Turn on until a choppy dough forms, several minutes. Add 2 tablespoons of the raw pumpkin seeds, and pulse until combined so the pumpkin seeds remain a little coarse. The dough will be slightly sticky. In a small food processor, quickly chop the remaining 2 tablespoons of pumpkin seeds with the chocolate chips -- this only takes 1 second; you want it chopped, not powdery. Pour mixture into a small bowl. 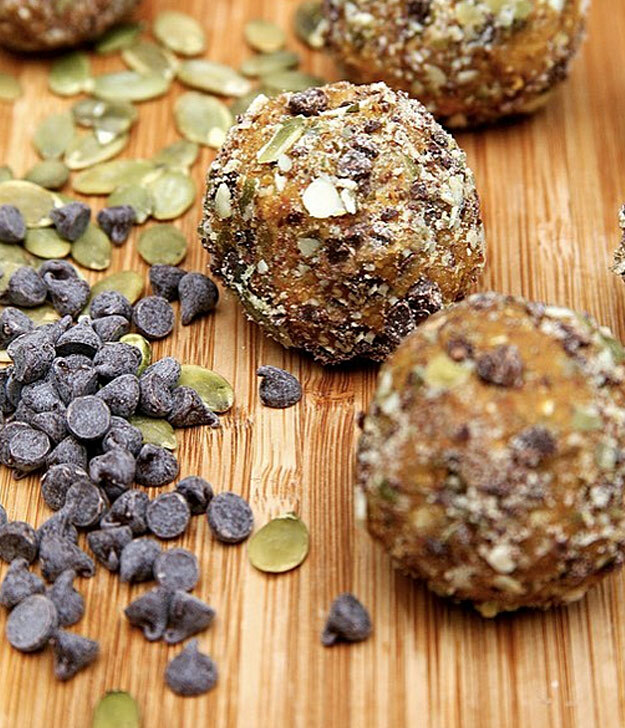 Roll dough into 20 balls, roll each in the pumpkin seed and chocolate chip topping, and place on a clean cookie sheet. Refrigerate for at least 20 minutes to set. Store uneaten balls in an airtight container in the fridge. These make a great snack or "breakfast on the run"!